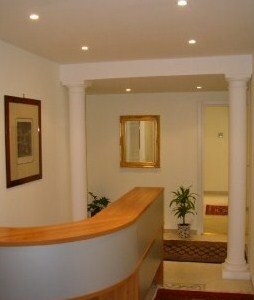 For info, prices and reservations go to our website: www.eurexecutiveinn.com and type "book now". Eur Executive Inn is located in the heart of the most exclusive area of the city: Eur. Only a few steps away are located: The Industrial Association, INPS, Palalottomatica, the Congrss Center, Eni, Foreign Ministry, Finance Ministry, "S. Eugenio" Hospital. The carefully remodeled rooms, all with en-suite bathroom, are stylishly furnished and offer every modern comfort including: plasma satellite TV, frigo bar, air conditioning, internet wireless connection. The bathrooms are furnished with: hairdryer, full bath accessories. In a few steps there are many shops,bars,restaurants and fast foods. The subway (Eur Palasport) is only 50 meters away, therefore you can reach the city centre in a few minutes. The sea(Ostia) and the airport (Leonardo da Vinci) are only 25 minutes away by public transportation. Trastevere (tipical roman area) is only 10 minutes away by bus.